The Hyper-V Cluster Shared Volume Disk Free sensor uses PowerShell commands. In order to monitor devices with this sensor Remote PowerShell has to be enabled. For detailed information, please see More section below. This sensor type needs the WSFC (Windows Server Failover Clustering) PowerShell Interface to be installed on the target machine. You can list all modules in the PowerShell console with the command Get-Module -ListAvailable. Here FailoverClusters has to appear. Under Windows 2008 and 2012 the interface is part of the VMM Administrator Console, or the VMM 2012 Management Console, respectively. The interface is everywhere available where the WSFC feature is installed: Windows Server 2008 R2 (SP1) Full and Core (not installed by default); Microsoft Hyper-V Server 2008 R2 (SP1); Remote Server Administration Tools (RSAT) for Windows 7 (SP1). 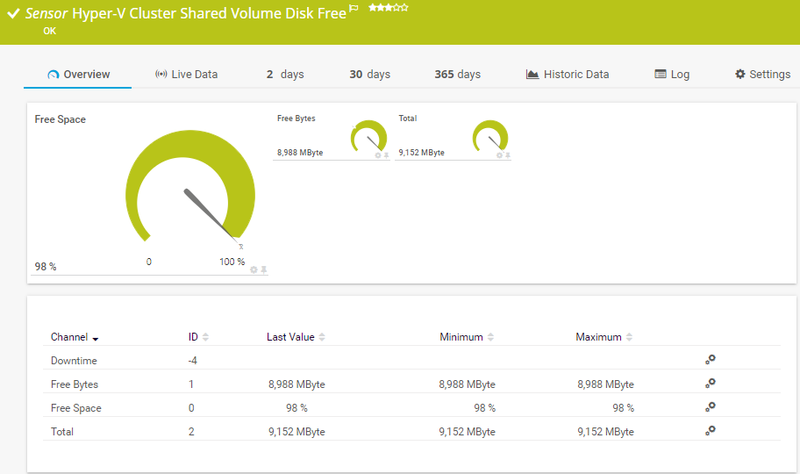 Select the disks you want to monitor. PRTG creates one sensor for each disk you choose in the Add Sensor dialog. The settings you choose in this dialog are valid for all of the sensors that are created. Note: Ensure the resource name of your disks do not contain unsupported characters, especially avoid the hash ('#') sign. We recommend to not rename resource disk name once you have set up monitoring. For detailed information, please see More section below.